Before you go backcountry skiing you need to check your local avalanche advisory and take classes if available. CLICK HERE to be directed to Gallatin National Forest Avalanche Video page for further video instructions and safety information. What’s a snow pit? Well you dig a snow pit to look at the different layers of snow that have been deposited and see how hard the layers are from new snow fall to wind loaded snow to previously deposited snow from earlier in the season. All of which is to access the snowpack to make smart and safe choices out in the backcountry. You dig a 5 ft long pit all the way down to the ground making it plumb so all the sides are square, the neater the pit the better the results. You need to do a compression test which is a is a 30 cm by 30 cm isolated column to look if the layers are going to break. Then you start from the wrist and tap 10 times, from the elbow 1o times and the shoulder 10 times, tap tap tapping. 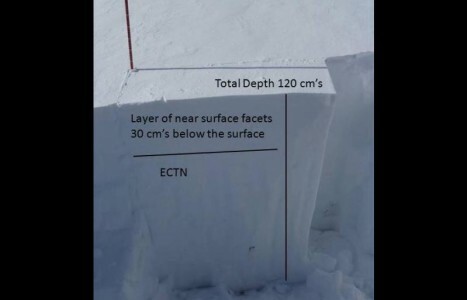 If you get breaks within the snowpack you check the quality of the shear. If it is breaking clean or irregular.